Over 60 pages of inspiration for adding print and pattern to your home, no matter your style preference. Artists, designers, creative entrepreneurs and more share favorites from their ephemera collections and how it inspires their art. Full of gorgeous old papers, intriguingly distressed, found bits and pieces, astounding objects of design from years past, nostalgic mementos and typographic treasures. 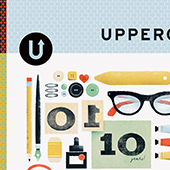 The 10th anniversary issue features tips on longevity from successful artists around the world, articles on art supplies, photos of dream studios, and over 80 covers curated from the 300+ entries in the first Uppercase cover design contest. Always full of design and project inspiration, this particular issue features holiday gift wrap and project ideas. Full of design and project inspiration, this magazine features trending and curated designs, all available on fabric, wallpaper, and gift wrap. This issue focuses on the combination of tiny cyan, magenta, yellow and black dots that work together magically to create all full-color process imagery. This special issue includes a Coloring Calendar insert, featuring artwork and daily affirmations by artists from all over the world. A DIY guide to designing fabric, wallpaper and gift wrap, with 30+ projects, including a zipper pouch made with my Risky Business print. Set decorator Ryan Owl Dwyer chooses one of my circus prints to decorate the baby's nursery in this supernatural horror film starring Maria Bello. This issue of the popular UK homemaking magazine includes a "Stitch & Style Patchwork Portfolio" booklet, featuring my Geekly Chic Cassettes fabric from Riley Blake Designs. Designer Stephanie Bracelin offers the how-to for making a fun holiday gift using my King of Cups print. Quilter Roslyn Russell is featured in this Australian magazine, presenting her quilt and quilt pattern using Geekly Chic Cassettes as the focal print. As a special insert for this issue, the first ever Surface Pattern Design Guide includes work from 100 top surface pattern designers. I went back to my publishing roost to illustrate the typography for the magazine's first annual Editors' Choice Food Awards feature. 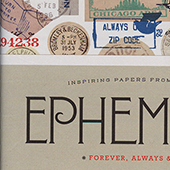 The magazine's letterpress-themed "Three's a Trend" feature includes my Woodtype Alphabet print. In this book, author Susan Beal offers up 24 stylish projects to stitch throughout the year, including a "New Year's Calendar" project that features one of my most popular tea towel designs. This issue of the popular UK sewing magazine includes four Color Card inserts, one of which features my Mix Tapes print. This seasonal book, published by Simply Handmade magazine, includes one of my prints in its "Tactile Triangles" spread. This volume off the industry's most respected trend forecasting trade publication features one of my first surface patterns, created with crayons. I go back to my graphic design roots to write about how typography can be a fun and easy technique to use in surface design. This Special Stationery Issue, with a scratch and sniff cover, includes an article I wrote about one of my favorite, nostalgic collectibles. Ariel offers a quick and easy tutorial for the tree skirt she made using my ‘Santa’s Workshop’ print on Spoonflower’s Celosia Velvet. Ariel from PMQ for Two curates a complete list of handmade goods that make the most thoughtful gifts. Includes five penny candy prints on fabric, plus three prints on fabric, and two tea towels. Ariel shows you how to throw the perfect holiday gift-wrapping party, from choosing the paper to recipes for snacks and drinks. Features four penny candy prints. My Stitched Gingham on Lightweight Cotton Twill is used in a simple tutorial that shows you how to whip-up a small smock for your little ones. As part of my #30daysofrainbows Instagram challenge, I rearranged my UPPERCASE Magazine collection so its spines were in rainbow order. An open call for entries includes one of my designs based on my Staxx print. Danielle Kurtz, Creative Director at The Land of Nod, writes about removable wallpaper and how it has all the impact of regular wallpaper, but with the commitment of a wall decal. Learning is fun with these adorable alphabet DIYs. Take a look at a few lovely DIYs that will inspire you to add a little handmade goodness to this sweet holiday. A nice article from the UK division of Hallmark Cards, with examples of my work. Plan your sewing getaways and skill-building adventures for the coming year with a selection of workshops, retreats, and expos. There’s one way to get the New Year started off on the right foot: Finding a cool calendar that will help you stay creative all year long. Susan Beal's Sewing for All Seasons is pretty close to perfect: lots of inspiration, modernity, realistic skill requirements and desirability of finished projects. Inspired by BlueBird Chic’s crochet camera cosy in issue 27 of Mollie Makes, this moodboard is dedicated to the cameras we love. Throw pillows are an easy way to give your most cozy spaces a little more of your own personality. And if your personality is a self-proclaimed geek, techie, blogger, photographer, voracious e-reader, or smartphone addict, then these are the prints for you to use in your next fabric or upholstery DIY project. I Am the Fire King! A short article on Fire King collectibles, including my King of Cups tea towel. Spoonflower staff member Allie Tate transforms her childhood French provincial desk into a fresh work station ready for new creative projects. Guest writer Emma Jeffery from the blog Hello Beautiful gives simple white serving trays a festive makeover using Spoonflower wall decals. As part of the Crafterhours Skirt Week series, staff members Allie, Caroline, and Melodie choose their favorite skirt fabrics. A competition with more than 900 entries. Brief: design a contemporary surface pattern for a male or female recipient that could be used across a range of our everyday stationery products. A competition to discover the next superstar fabric designer. From hundreds of artists, the field was narrowed down to eight finalists, each of whom was asked to create a collection inspired by the theme of GeekChic. In honor of the excitement that goes with the annual back-to-school tradition, for this contest Spoonflower asked designers to come up with fabric designs celebrating school supplies. The tea towel calendar contest this year did not disappoint…all of the entries were stunning!